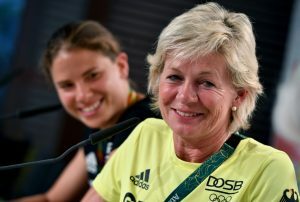 Silvia Neid is ideally placed to comment with authority on women’s football, having won a host of world and European honours as coach of Germany. As UEFA Women’s EURO 2017 approaches, she talked to UEFA Direct’s coaching supplement, The Technician, about the remarkable progress of the women’s game and its prospects for the future. At the start of the year, Silvia Neid was named FIFA Women’s Coach of the Year for the third time, capping an unprecedented coaching career. 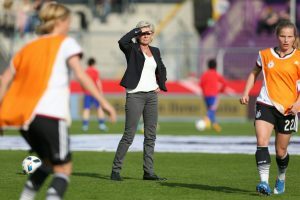 She stepped down as national team coach after winning gold at the Olympics in Brazil, and now heads up the DFB’s women’s and girls’ scouting department. The Technician met up with the former world and European champion to talk about her new role and the future of women’s football. Silvia Neid, congratulations on being named FIFA Women’s Coach of the Year. How was the awards ceremony? I was very happy just to be there as one of the three shortlisted nominees. It’s always a wonderful evening; you meet some really exceptional people. It was a great honour to win the award for the third time. It felt like the icing on the cake. There’s no better way to end my career with the women’s national team. Although I’m well aware that I couldn’t have done it alone. You can’t win without your team, and the team behind the team. I really can’t emphasise that enough. You are now running the DFB’s women’s and girls’ scouting department. Can you tell us what that involves and what your priorities are in this new role? We want to keep an eye on other countries. It’s important to be looking out for new trends and developments in women’s football. That’s my responsibility. Our aim is to be a few years ahead of the game and the players need to be trained accordingly. I share my findings with the new national team coach, Steffi Jones, and she decides what to do with the information. To what extent is your role as head of scouting about watching matches on the one hand, and discussing what you see on the other? After 20 years in various coaching roles, I’ve learned a thing or two. Anyone involved in women’s football will have noticed that the Asian countries are making great strides. It’s not for nothing that they’re winning so many titles at youth level. I’m thinking of North Korea and Japan in particular. And in my new role, I’m very keen to know how they’re doing it. How has Japan got so many well-trained players? And consistently over time, also at youth level, i.e. Under-17 and Under-19. That’s something that’s really struck me. They must be doing something special in terms of player development, and that interests me. There are also things happening in Spain. These are all trends that we have to keep an eye on. Can you share with us your initial insights? What makes the Japanese so good, for example? They place a lot of emphasis on the basics and on technique. They work very hard and coach intensively in these areas. Take looking over your shoulder as an example: every player looks over her shoulder three times before receiving the ball. So she knows what’s going on behind her. I find that pretty impressive, and fascinating. I would love to go to Japan to see for myself what exactly they’re doing there. At the same time, I must say that in Germany we are also trendsetters, and will continue to be so in the future. We’re already doing a good job, but you have to keep your eyes open and want to learn from what you see going on elsewhere. The boom in women’s football development over the last few years has been plain for all to see. What are your thoughts on this and how do you see things now? The progress has been incredible. When I think back to my first international in 1982, it really is unbelievable what has happened since then. Everything has improved, athletically, tactically, technically, and in terms of speed. It’s now more or less on a par with men’s football. Everything has progressed and improved. What tactical improvements have impressed you the most? Lots of trends are taken from men’s football. Like screening midfielders, for example. At the Olympics, Sweden showed that they play deeper than usual. They tried to allow very little space in their own half. These are also trends and tactical developments. The players are simply better trained. In that sense, we’re all on the right track. To what extent have tactical elements and even playing styles been taken over from the men’s game because of all the footage available that you can use with the team? I have done that. I really like how Dortmund were playing a few years ago. I still really like their style of play. We watched a few bits and pieces and took some footage to show to our players. Then it was a question of putting it into practice. Did you also have technical discussions with Joachim Löw, the men’s national team coach? A few times a year at least. I used a few of the things they were doing in the men’s game. I already had a good relationship with the scouting department and when I found something interesting, I could get whole sequences edited together. In that respect, there was always a lot of very close cooperation. How would you describe what Joachim Löw has achieved with the men’s national team, starting as assistant coach and over the course of the DFB’s restructuring in the early 2000s? Joachim Löw has done a lot for the men’s game. He has shaped men’s football in Germany and moved it forward. He has also been FIFA Coach of the Year and is world champion. I think we play really excellent football. We play offensively and had some great games at the EURO in France. Obviously there’s also always an element of luck involved. You have to hit the back of the net at the right time. Let’s talk briefly about grassroots football. Which particular areas need more attention, in your opinion? I think we can be very pleased, just looking at the numbers. Lots of women and girls play football. In Germany, at least, it’s the number one sport. We have schools and academies where football is offered. We’re very much on the right track. Obviously it’s good for the sport when you get titles. We see that in tennis too: Angelique Kerber is now world number one and tennis has become more popular again among youngsters as a result. We need to keep winning in women’s football and make sure that girls get interested in the sport. Naturally, we must then also ensure that we have a strong elite. It’s all about player development. Research in Europe shows that you can get lots of girls into football but most of them drop out as teenagers. What’s your take on this trend? It’s perfectly normal. Perhaps girls that aren’t so good or aren’t 100% into football decide they’d prefer to play tennis. Perhaps they’re better at tennis. Often they only work these things out as teenagers. But I honestly don’t see this as a problem. We can be proud that we’re the number one sport overall. What do you think can be done Europe-wide to promote ambitious coaches, male or female, in women’s football? We’ve always tried to encourage female players to train as coaches. And it’s paid off. We have lots of women who used to play on the national team now working in coaching. Germany has been leading the way for years in that respect. [Former national team coach] Tina Theune started it off and I kept it going. The important thing is to have players who really put their hearts into it. They have to pass on their experience to the next generation. To be honest, I don’t really know what it’s like in other countries. I can only say that the tendency seems to be to promote women. In Japan, for example, they have now appointed the first woman as head coach of the [women’s] national team. Why do you think it’s important for national associations to try to keep successful female players in football after they hang up their boots? Because they obviously serve as role models for young girls and they do what they do first and foremost because they are passionate about it. When you love what you do, you can give it your all. We’ve had very good experiences of this. As long-standing European champions, the expectations on Germany at Women’s EURO 2017 will once again be extremely high. How do you deal with that pressure? Everyone expects you to win. But the teams that ultimately do know only too well how hard it is. You need absolute concentration. It’s hard work and you need a pinch of luck too, to come out on top. I have only ever taken it one match at a time. Germany certainly have the potential, but it’s never a foregone conclusion. It has to all come together at the decisive moments. You need to score at the right time, and when you make tactical changes, they have to be the right ones. Which team could cause an upset at the Women’s EURO? Spain, perhaps? The favourites are the four usual suspects: Norway, Sweden, France and Germany. Unfortunately for France, they have still never won a title, despite being considered one of the favourites for years now. They really have first-rate players who are very technically accomplished. They play a very intelligent game, but somehow it’s never quite been enough. I’ve got my eye on Spain, and maybe also England. Both teams have made outstanding progress over the last few years. The field has been expanded from 12 to 16. What effect will that have? I’m very curious to see. There are definitely enough good teams in women’s football, in my opinion, to increase the field by four without there being any drop in quality. Take Scotland, for example, where we’ve also seen steady progress. I think we have a good format. It’s clear at the outset that the top two teams in each group go through and the third and fourth-placed teams go home. I don’t know what will happen but I think it’ll be good. Berti Vogts once said it was ‘getting crowded at the top’ – to what extent does that also apply to women’s football over the last few years? A lot of countries have made a great deal of progress. There are more favourites now than 12 years ago. Obviously I’m thinking of France, Sweden, Norway, Spain, England and Germany. But more and more countries have come along that are now out to win titles. No European team has won the Women’s World Cup since 2007. There wasn’t even a European team in the last two finals. Do you think this is just a question of luck or is Europe being overtaken by other countries? There are excellent teams all over the world that are capable of winning the World Cup. Take Canada, for example, who have taken bronze in the last two Olympic Games. And the US, who we know have been preparing together very intensively for a long time. Then there’s Japan, whose praises I’ve already sung. And Brazil. Obviously Europe also has to keep advancing if we’re to have another world champion. But it’s not that easy. I think that every country is investing a lot more than they were just a few years ago, to prepare their players for such tournaments. Clubs are signing lots of top players from Brazil, Japan and the US. To what extent is this a challenge for European clubs and local player development? If you look at it in a positive light, the overall standard is being driven up. Players coming in from other countries add a lot of quality to the mix. We just have to make sure that the young players don’t get sidelined or perhaps get loaned out. It’s important that they get to play. And it’s important that when they’re at that stage of maximum potential, they’re given the opportunity to develop it. That may mean they have to play for other teams and push their way through the ranks. But young players at teams that sign the big names can also learn a lot. There are pros and cons, at the end of the day. Ultimately each team has to decide for itself. Where do you see women’s football in five years’ time? Reaching new heights. Perhaps even faster and more athletic. I think there will be even more players and bigger squads. In any case, I see it advancing. Women’s football hasn’t had its heyday yet.